Very early in the morning we will pick you up from your hotel to transfer you by bus to the km 82 where we will arrive mid-morning. We will meet there the members of the staff who will join us for the trek, porters, cooks, etc. Then the trekking begins. This first day is pretty easy the first kilometers. We will have a beautiful view of the Veronica glacier and we will walk near Vilcanota River until we get to the archaeological complex of Patallacta. We will have lunch and rest before continuing to Huayllabamba where we will set the first camp. After breakfast, the hardest part of the trail begins because we will reach the first step called Warmiwañusca up to 4200 m.a.s.l. You will enjoy incredible panoramic views of the mountain chains of this area. After lunch, we begin the way down towards Pacaymayo valley where we will set the second camp. Early in the morning, only after a 30 minute walk, we will fin the archaeological complex of Runkurakay. 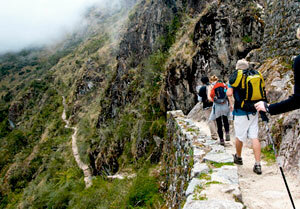 At his point we will see the inca trail is completely covered with stones and some places it is up to 2 meters wide. 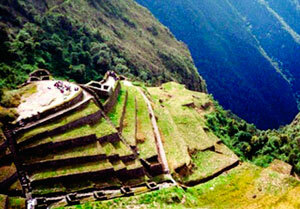 We will see Inca architecture; we will visit Sayacmarca, a beautiful complex. We will also go through a tunnel to reach the archaeological site of Phuyupatamarca. Then, we will continue the way down through an interesting path, covered with dense vegetation of the rainforest, very rich in plants and animals. Two hours later, we will arrive to Wiñayhuayna where we will set the third night camp. 4.00 am Very early, we will have our breakfast and then begin walking to get to the Intipunku (Sun Gate), from where we will be able to see the Citadel of Machu Picchu. In the morning, we will have a guided tour of the citadel (a duration of about one and half hour) visiting the Main Square, the Circular Tower, the Sacred Solar Clock, the Royal Quarters, the temple of the Three Windows and the cemeteries. Free time to stroll around the citadel. 6.30 pm return by tren to ollantaytambo station and road transport to Cusco. End of our services cusco main square: arrive aprox 22.30 hrs. English Speaking Guide, cook and assistants. tents for 2 persons plus mattresses. Roomy dining tent, kitchen tent. Chairs and tables in dinning tent. Service of porters to carry all common equipment and food. tourism transport, also bus from Machu Picchu to Aguas Calientes. 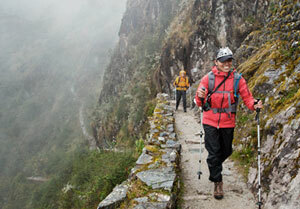 Tips for the trekking crew, guides, cooks and porters.